Sally Hawkins, Bob Hoskins. Set in Britain in 1968, shows how women workers at a Ford plant achieved pay equity with men though labour action. She says: Really positive view of history that you realize must have been streamlined somewhat for dramatic purposes, but still makes for a pretty engaging movie. He says: It was mostly good, but it was slow in parts. The movie ends with the point that having achieved this milestone, the concept of “equal pay for equal work” for women spread throughout Britain, then through other industrialized countries. Of course, that’s for unionized jobs with clear pay scales. 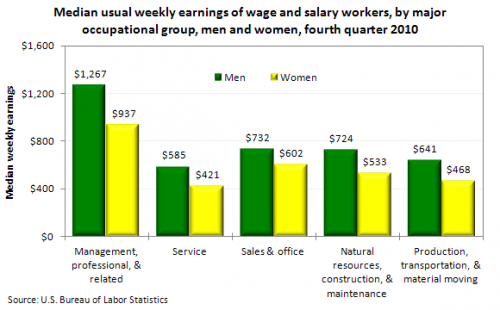 The picture is a bit more murky in other cases, as per this recent chart comparing men’s and women’s wages in US.